This is the first in a five part theme week marking the centenary of income tax in Canada. This summer, on the 100th anniversary of the passing of Income War Tax, I’ve seen the same fable repeated half a dozen times. No, it wasn’t a temporary tax, and no, it wasn’t introduced to pay for the First World War. It was introduced to win over a particularly difficult section of the public, one whose opposition to the war and to the economic system it was being fought to protect was growing rapidly. More to the point, income taxation wasn’t brought in by an overzealous government using the war as a pretext for a money grab. The people wanted income taxation, and welcomed it as better than consumption taxes. Organized farmers and workers in particular wanted it, and campaigned relentlessly for it in their newspapers. It was the government that was resistant, but they had no choice: their feet were to the fire. 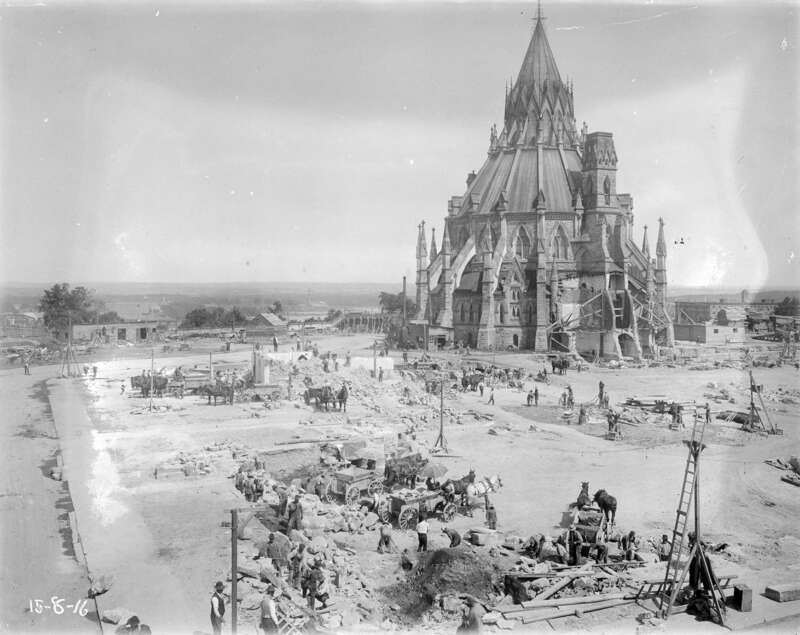 The fire had come the previous year, engulfing the centre block of the Parliament buildings one February evening in 1916, devouring the Senate chamber and the House of Commons before tearing up the Victoria Tower, gutting the building by the following morning. 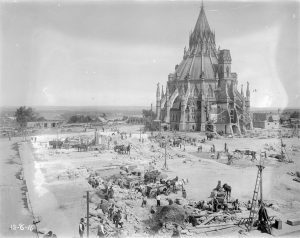 For the next five years, until a new Centre Block was completed in 1921, Parliament was relegated to a temporary home at the Victoria Museum (now the Museum of Nature) on Metcalf Street. To an affectionate critic of the Canadian political tradition like Leacock, this polarization was troubling. In a telling phrase, Leacock wrote that, “Parliamentary discussion is powerless. It limps in the wake of popular movements.” If Parliament was not to become redundant, it had to get on board, or try to, with “popular movements,” “limping in the wake” of a polity that was less and less impressed with the old differences between Liberals and Conservatives. That the Income War Tax was introduced while Parliament was at the Victoria Museum, struggling against irrelevance in an unfamiliar space, provides us with an easy interpretive rhyme: Parliamentarians experienced the fire and income taxation in much the same way, as a disastrous and uncomfortable imposition on the cozy world of two-party politics. The last half of the First World War represents a kind of hinge between two conceptions of politics, the eclipse of an older conception of political leadership that was comfortable and familiar to Parliamentarians, and the beginning of a new conception of politics in which they were no longer clearly in charge, and in which they had to struggle and adapt in order to hold on to power that they had previously taken for granted. The war itself was obviously an immense factor in this, though a highly ambivalent one. The war was a little like 9/11 in its ideological arc: at first it produced an all-consuming jingoistic response, but this effect soon boomeranged into a critical reaction. The pious unanimity that papered over the immense social tensions in Canadian society in late 1914 quickly eroded. As the casualty lists grew and stories appeared of soldiers sent to fight with substandard equipment and provisions, and of suppliers making unfathomable profits while prices rose at home, attitudes hardened. Business was increasingly seen as profiteering, making unprecedented profits at the expense of soldiers’ safety. Politicians were seen as cynical partisans taking advantage of the war for party gain. The actions of the elite led to growing cynicism, and an ironic, bitter perspective took over. The fire coincided with a turning point in the political culture of the First World War, a shift from a volunteer ethos to a more controversial coercive approach – epitomized by the introduction of conscription in 1917. The government’s decision to introduce conscription was unprecedented and, because it was vehemently opposed, demanded unprecedented concessions. The greatest of these was income taxation. The political campaign for income taxation is inseparable from ‘Conscription of wealth,’ the dangerous slogan that conjured it out of a reluctant government. ‘Conscription of wealth’ embodied a sense of fair play, but also a lot of inchoate resentment against old privileges and deepening inequalities. It could be interpreted very radically, as confiscation of capital, or more liberally, as everyone doing their part. But the key is that it originated elsewhere, in the farmer and labour press. Its introduction into Parliament made a lot of people uncomfortable. This kind of speech was a big part of the debate on the Income War Tax in the summer of 1917, a debate that was remarkable for its intensity and also its self-consciousness, as Liberal members, many of them veterans of Wilfrid Laurier’s cabinet, vied to say the most outrageous and shocking things while criticizing the bill. This kind of talk was dangerously open-ended and ominous. And the government especially made its nervousness obvious, the Conservative Ottawa Journal decrying ‘conscription of wealth’ as “the cheap claptrap one expects from the loose-minded.” No one wanted to talk about ‘conscription of wealth,’ and no one wanted to introduce income taxation. The introduction of income taxation reflected the further ascendancy of political modernism during the First World War, and the increased desperation of maintaining the old political imaginary under new conditions. The parliamentary debate, and the self-consciously radical rhetoric of some parliamentarians, reflected the heightened political tensions of wartime politics, but even more so the unprecedented centrality of new political actors, notably the labour movement, which had done so much in the lead-up to the debate on the Income War Tax to make ‘conscription of wealth’ a powerful and ubiquitous phrase. More than this, though, the centrality of labour in determining the rhetorical stakes of the Income War Tax reflected a changed political calculus. For many voters, the party system was being eclipsed by a newer, more modern opposition between both parliamentary parties – the Liberals and the Conservatives – on one side and popular movements, whether farmer or labour or otherwise, on the other. The parliamentary debate that marked the introduction of income taxation at the federal level perfectly illustrated the ‘break with the past’ that sought not to reform the old parties and their nationalist imagery, but to burn parliamentary politics, and its tradition of gentlemanly rhetorical combat, to the ground. It is important, if we want to understand the introduction of income taxation, that we understand why it appealed to people: not as a source of revenue, but as a punishment for the rich. Certainly some people saw income taxation’s importance in its contribution to fiscal capacity. Leacock, in fact, wrote that the post-war period would see increasing demands for public spending, and noted that “the terrific engine of taxation already fashioned in the war” would support it. But that’s not why income taxation was brought in. It was introduced because it was popular, and it was popular because organized farmers and workers believed the rich were benefiting from the war and needed to pay until it hurt, or until they were no longer rich. The desire for an income tax was a negative desire, akin to what Carlyle, in his History of the French Revolution, called the “destructive wrath of sans-cullotism:” a mob’s gleeful tearing down of the ancien regime without any immediate plan for what would replace it. People like Linda McQuaig who say that the introduction of income taxation was important because it allowed the federal government to grow and create a welfare state are right, but their arguments are too neatly teleological: they reflect what income taxation became, not why it became. Their stories, though broadly true, make builders and reformers out of people who wanted to destroy, and in doing so they invite us to forget what people wanted so badly to destroy, and why. People scrawled ‘conscription of wealth’ across the letters pages because they were angry, broke, and grieving, and they believed that rich people were getting richer off their misery. They believed that the struggle between Liberals and Conservatives in Parliament was irrelevant to their lives and the realization of their political hopes. They wanted income taxation because they wanted the rich to suffer; it was sometime after that they realized they wanted Family Allowances too, and that income taxation made that possible. As important as income taxation’s contribution to the state’s fiscal capacity would become, its origins in a destructive campaign to undo the niceties of the party system shouldn’t be ignored. Parliament’s loss of prestige, its humiliating need to follow “in the wake of popular movements,” to mouth the “cheap claptrap” of ‘conscription of wealth,’ often awkwardly and unconvincingly, was a key contribution to democracy in this country. A politics in which people might vote their interests, intelligently assessing what kind of policies they support, and demanding a party system that admits those possibilities, is a necessary condition for a meaningful democracy. To the extent that such a politics has existed in Canada, it is a legacy of the destructive energies that drove the introduction of income taxation in 1917. This is a very good piece as far as it goes but omits to mention that many feminist activists demanded conscription of wealth. Like labour and farmers, they wanted to call governments to account for corruption and mismanagement. Income tax was one concession by desperate politicians but so too were the limited female federal franchises of 1917 and 1918, even as many MPs declared their indifference or antipathy to the idea of levelling gender’s political playing field. A very interesting juxtaposition. I do have to quibble about the line “The war was a little like 9/11 in its ideological arc: at first it produced an all-consuming jingoistic response, but this effect soon boomeranged into a critical reaction.” I don’t get out much, so I may have missed something, but I’m not aware of a lot of popular “critical reaction” to 9/11, certainly not with the five-year time scale of WWI. “All-consuming jingoism”, admittedly ever-more threadbare, still seems to be dominant mode.